Pittsburgh, PA (November 23, 2015) – For three generations, Howard Hanna Real Estate Services has been a leader in real estate sales innovation and philanthropy, serving Pennsylvania, Ohio, Virginia, Michigan, New York, West Virginia, North Carolina, and Maryland, The company and its more than 7,000 agents and employees not only provide a vital service but also work hard to improve their local communities by supporting the efforts of their local pediatric hospitals. They have put their considerable talents and networks to work by raising funds for these children’s hospitals via their series of distinctive “Choo Choo Chow Chow” events. Over the years, offices and agents have given thousands of people the chance to contribute to the care of area children by attending luncheons, tailgate parties, wine tastings, murder mysteries, tours of every kind, and other creative ways of raising support. 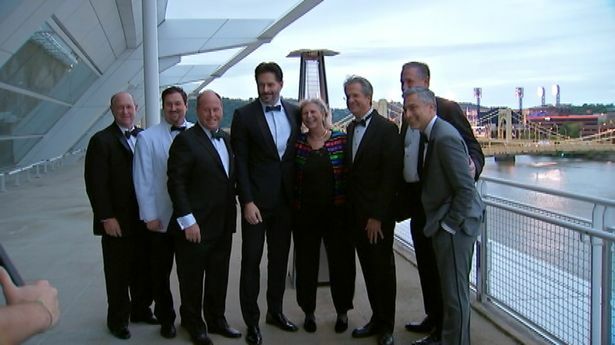 Howard W. “Hoddy” Hanna, III, Chairman and CEO of Hanna Holdings, has volunteered his time talent for 22 years as a trustee of Children’s Hospital of Pittsburgh. He is also a founding trustee of its Foundation, and he currently serves as the Chairman of its Board of Trustees. Howard Hanna’s generosity during the construction of the new hospital made possible the creation of the Howard Hanna Healing Garden. Completed in 2009, this unique green space makes it possible for patients, families, and staff members to enjoy peace and fresh air without leaving the hospital. Children’s Hospital of Pittsburgh held its 125th anniversary celebration last month at the David L. Lawrence Convention Center, and in front of more than 1,000 guests, Howard Hanna received the Beacon of Hope award in recognition of their efforts on behalf of the children in their communities and its annual campaign to better the lives of kids and families in need. In addition to Children’s Hospital of Pittsburgh, Howard Hanna partners with 10 other children’s hospitals in their market areas: Hershey Medical Center (Hershey, PA), Hamot Medical Center (Erie, PA), Shriners Children’s Hospital (Erie, PA) University Hospital/Rainbow Babies (Cleveland, OH), Cleveland Clinic Children’s Hospital (Cleveland, OH), MetroHealth (Cleveland, OH), Akron Children’s Hospital (Akron, OH), Nationwide Children’s Hospital (Columbus, OH), C.S. Mott Children’s Hospital (Ann Arbor, MI) and Children’s Hospital of the King’s Daughters (Norfolk, VA).